Along the 179-mile Illinois Lincoln Highway, you will find over 30 interpretive gazebos and murals that help tell the story of America's First Coast-to-Coast Road. Dedicated in 1913, the Lincoln Highway runs about 25 miles through the Chicago Southland from Lynwood in the east to New Lenox in the west. 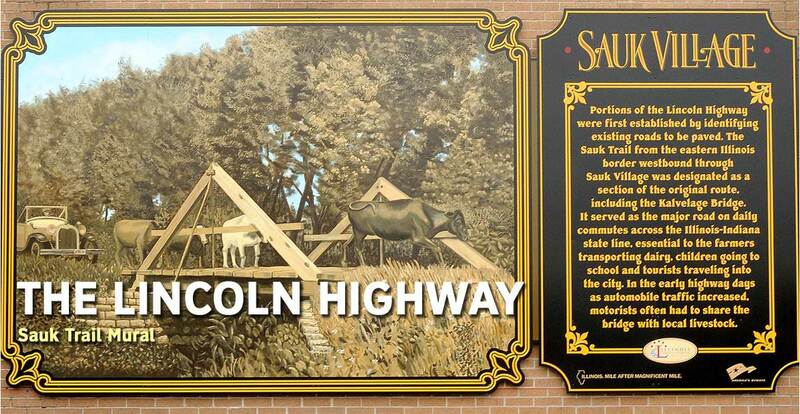 A series of nine murals were completed in 2012 featuring local and national Lincoln Highway history. 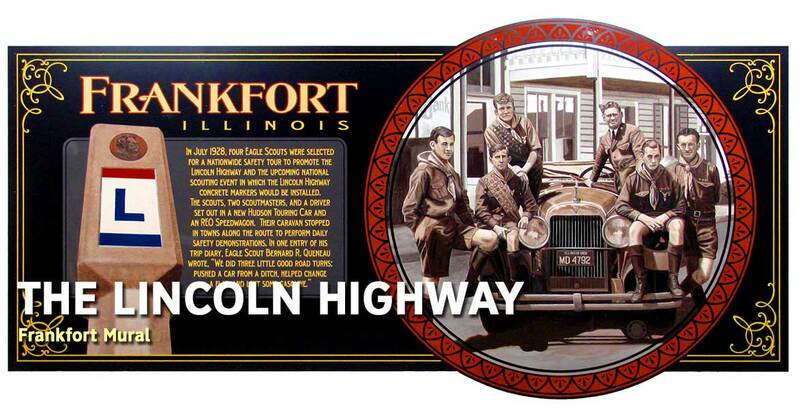 The Illinois Lincoln Highway Coalition created these murals with support from a National Scenic Byway Grant from the Federal Highway Administration and an Illinois Department of Commerce and Economic Opportunity, Office of Tourism, Attraction Development Grant. 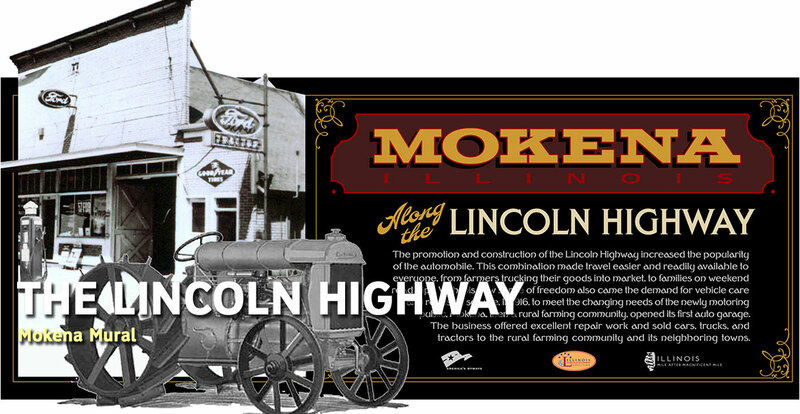 2013 marked the 100th Anniversary for the Lincoln Highway. Jay Allen, owner of ShawCraft Sign Company, created the interpretive mural series and shares some of the secrets he left in the paintings for you to find. For example, all of the murals have a very subdued "Allen- Hueg-Marshall" or "Allen-Marshall" logo painted on them along with the year they were painted. 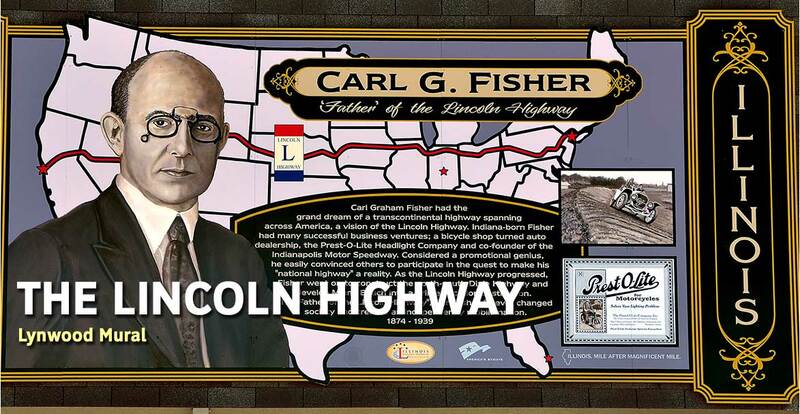 Mural: The mural tells the story of Carl Fisher, the father of the Lincoln Highway. Fisher believed that the popularity of automobiles was dependent on good roads and in 1912 he began promoting his dream for a transcontinental highway. Can you find it? The initials RG for a departed friend and fellow artist Reneata Guzman. Mural: The mural shows the early history of the Sauk Trail where automobiles and livestock "share" the Kalvelage Bridge in route to their destinations. Sauk Trail was designated as an original part of the Lincoln Highway through eastern Illinois and was a major road for daily commuter traffic. Can you find it? Hidden family names in the tree, and a message to Jay's wife, Jody. Mural: The Mural is based on a vintage photograph of the McEldowney Bridge where the Lincoln Highway crosses Thorn Creek. The bridge included advancements like separate and protected pedestrian walkways and concrete lanterns. The first Field Secretary of the Lincoln Highway Association, Henry C. Ostermann, crossed this bridge bi-annually as he inspected the new coast-to-coast highway. Can you find it? A small plaque is painted on the mural with the names of the people who made the mural trail possible. There are also two golden screws that were put in place by Chicago Heights Mayor David Gonzalez and Illinois State Representative Anthony DeLuca that mark the completion of the nine mural trail in the Chicago Southland. Mural: The mural commemorates the proclamation of the route and the naming of the first coast-to-coast highway in honor of President Abraham Lincoln. 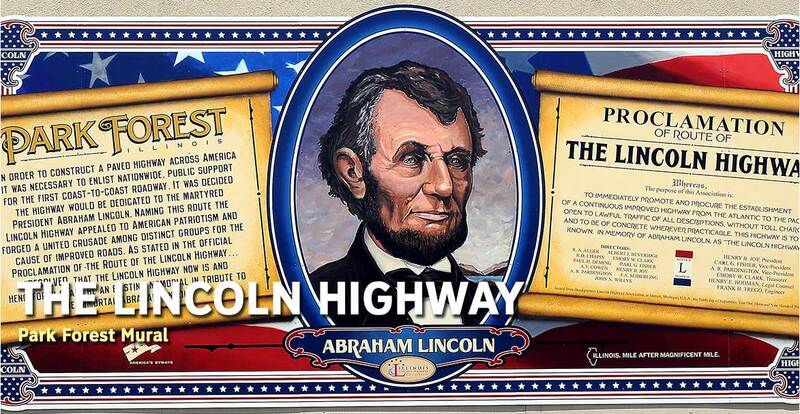 Because the founders of the highway needed to rally Americans from all walks of life, the highway was dedicated to Lincoln as a lasting memorial and that the establishment of a paved highway was everyone's patriotic duty. Can you find it? There are very small hidden family names and the RG initials mostly in Lincoln's hair. Mural: In 1916, Adeline and Augusta Van Buren set out to prove women could ride motorcycles across the country to serve as military dispatch riders. They became the first women to make a solo coast-to-coast trek on the Lincoln Highway traveling from New York to California in about two months. Can you find it? No secrets are found in this mural. According to artist Jay Allen, this is the most detailed of all the Lincoln Highway murals and should be viewed close up; so it wouldn't be appropriate. Mural: As transportation increased along the Lincoln Highway, so did the need for roadside assistance and automobile repair. The Mahler family's garage was there to meet the needs of the increasingly mobile public. The mural is displayed on the actual building that is shown in the mural. Holes on the sides for binding and photo mounting corners on the images make the mural look like a page from a family photo album. Can you find it? A plaque on the tow truck that details the project. The birthday of Jay's wife Jody and "I miss you, Dad" dedicated to Jay's late father. Mural: In July 1928, four Eagle Scouts were selected for a nationwide safety tour to promote the Lincoln Highway and the upcoming national scouting event in which the Lincoln Highway concrete markers would be installed. Their caravan stopped in towns along the route to perform daily safety demonstrations. Can you find it? The initials and birthday of a family friend on the car and Folker's Hotel, a Frankfort building in the 1920s, is pictured in the background. Mural: As roads like the Lincoln Highway made family weekend trips and other automobile excursions more popular, automobile garages began to appear across America. In 1916, Mokena's first automotive garage opened to assist the new motoring public. Can you find it? The initials "RG" are hidden in the work as a tribute to the artist's father. Mural: The trolley line that served New Lenox ran between Chicago Heights and Joliet and although dependable, it was quite slow. With the development of the Lincoln Highway a new form of independence for motorists and increased automobile traffic became a way of life, passing up the need to depend on trolley schedules and routes. Can you find it? In the overhead bridge, artist Jay Allen and other family members have their names on the bridge. The word love is painted on the pole and in the road multiple times. How many can you find?